Trust between a surgeon and patient is earned and is of the upmost importance. My goal is to get my patients back to doing the activities they enjoy with the people they care about in the safest way possible. Dr. Armaghani received his fellowship training in adult spinal surgery at the Emory University School of Medicine, widely considered one of the top spine fellowships in the country. He is board certified by the American Board of Orthopaedic Surgery. As a spine surgeon specializing in degenerative spine conditions, he has a particular interest in the causes and treatments of neck pain and back pain, although he treats all spinal disorders. Dr. Armaghani uses a nonsurgical approach and minimally invasive techniques with the goal of returning his patients back to enjoying the activities they love, in the safest way possible. 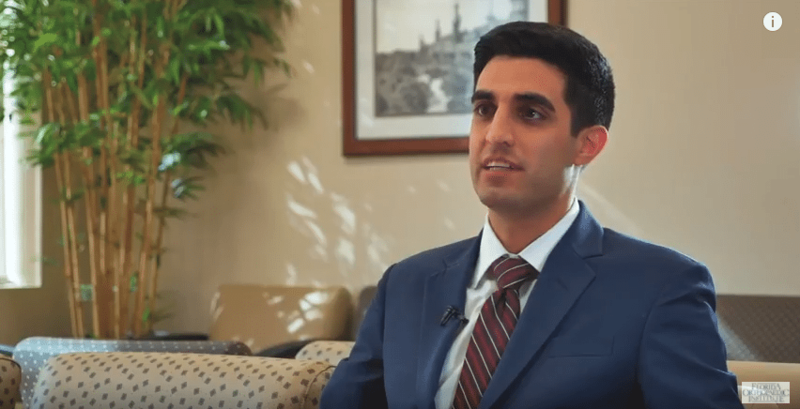 Dr. Armaghani was born and raised in Gainesville, FL where he was accepted into an accelerated undergraduate/medical school program at the University of Florida. 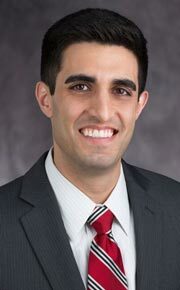 Following medical school, he completed his residency at Vanderbilt University where he was named chief resident and was granted awards for his research. Dr. Armaghani has co-authored over twenty-five publications and has delivered presentations at national meetings on topics that range from post-operative pain management to the treatment of patients with diabetes. His most recent research interests include identifying factors that influence outcomes following surgery and minimizing complications. Trust between he and his patients are of the utmost importance to Dr. Armaghani. His approach with his patients consists of easy to understand conversations focusing on maximizing their improvement with conservative or surgical methods, while at the same time minimizing risk. Dr. Armaghani enjoys cycling and college football, specifically his alma mater the University of Florida. Dr. Armaghani listened when no body would. He took time with me. Nothing but the best to say and I would send anyone I know to him. I came to Dr. Armaghani as a second opinion. Another doctor offered stem cells and a disk replacement for a disk herniation. Dr. Armaghani diagnosed my problem correctly and, after a small outpatient surgery, I am pain free. Dr. Armaghani saved me from unnecessary procedures. Very pleasant and informative. He explains things well. You know what to expect for surgery and the goals after. I am so very glad I chose Dr. Armaghani. I am 99% back to normal and expect 100% in the next few weeks. Very, very good experience! Dr. Armaghani takes his patients seriously. He is very professional, kind and related very well with me. He listened to my concerns and his gentle manners made me feel at ease before and after surgery. He personally called my son who was at University to update him after my surgery. I credit Dr. Armaghani for saving my life. The office staff is friendly, professional and I am always seen on time. Dr. Armaghani is very personable and easy to talk to. I was confident that he understood what my back problem was and that he knew how to fix it. I had a wonderful surgical experience and a great result. Now, I have no pain at all. Before surgery, I was constantly in pain and never though I would feel normal again. I am now able to stand up straight which I did not think was even possible. I will always recommend Dr. Armaghani. I would recommend Dr. Armaghani to anyone with back problems. I suffered with back pain 24/7 for almost five years. Dr. Armaghani performed surgery on me in 2018 and my pain is completely gone. Not only is he a top notch surgeon, he is a wonderful and caring person who values greatly his relationship with his patients. He never fails to shake hands when he enters the room. That, to me, is very unusual these days and very caring. I knew from my very first visit that he was the doctor for me. Never imagined I would need spine surgery. I feel blessed and thankful for FOI, Dr. Grayson and especially Dr. Armaghani for expediting my 6/26 lumbar microdiscectomy, when my MRI showed a large herniated disc resulting in constant agonizing nerve pain. Surgery took one hour. I was admitted and released the same day and immediately began walking and taking stairs with manageable pain. The difference between my experience and what I saw my father go through 15 years ago was incomparable on all levels. I can’t say enough about Dr. Armaghani’s superior expertise, professionalism, compassion and patient follow-up. He is truly the best cervical, thoracic, lumbar and minimally invasive spine surgeon. I’ve told family and friends over and over that my experience was nothing less than VIP. Thank you FOI! Me having surgery with Dr. Armaghani turned one of the worst situations into the best one. I was in so much pain, but also scared to have surgery. Three months later and I couldn’t be happier. My only regret is not seeing him sooner. Thank you Dr. Armaghani. He is, simply put, THE BEST! Dr. Armaghani was professional, attentive and caring. I am glad I was referred to him by my primary care. He explained the procedure to me in detail and helped allay my fears and concerns. Before the surgery, I was in so much pain. Now, after surgery, I already feel so much better. I actually get up in the morning and am happy to get moving. Thank you so much!! Dr. Armaghani first made an examination with an X-Ray and an MRI scan. He made his diagnosis and suggested I take the time to check the procedure online as well as whatever I needed to feel comfortable. My procedure went very well. Dr. Armaghani did exactly as he had stated and the pain I was suppose to have did not happen. Great outcome from the best spine specialist in the Tampa area. Thank you again! I doubt there is enough space allowed to say how wonderful Dr. Armaghani is! My spine has had many issues and I knew of a few successful surgeries among my friends. I’d consulted another surgeon, who I found rude! When I consulted with Dr. Armaghani I found compassion and understanding for my concern. He explained my issues and went over each vertebra one by one in detail. His demeanor was calm, relaxed, and assuring! I was diagnosed with a pinched nerve causing sciatica pain down my left leg causing pain, difficulty walking, and pretty much doing anything. I saw Dr. Armaghani who showed me on my x-ray the compression of the nerve. I opted for surgery in August and within 4 weeks all of the leg pain was gone and I could do anything without pain. I wish to thank Dr. Armaghani, his staff, and all the caregivers at the hospital. Everyone was awesome and it has been a life changing experience. Dr. Armaghani is awesome! At 67, I was having trouble standing up straight, bending over with pain down my legs. I had a previous fusion of L2-4 from a burst fracture 19 years ago. He showed us how he could add 2 cages in my lower lumbar area to pull me back up. I also had bone spurs impinging my spinal cord. So, after 2 surgeries 2 days apart, I am standing straight, the leg pain is gone, and I am so grateful God led me to his office. Dr. Armaghani is extremely compassionate, gives you all the time you need, and is surrounded by an excellent staff and facility. Vanessa was just awesome, handling all the appointments for testing, hospital, etc. I can’t thank them enough for giving me my life back. Thank you! I have experienced lower back pain for years. While I would have flare ups that were extremely painful, I knew they would pass and while I could not do all the things I used to without pain or extreme caution, I could function. I could walk, I could drive, I could power through. I was not someone who would ever allow myself to miss a day of work for my back. Over the last year, the flare ups became more frequent and the intensity seemed to be increasing. I began seeing Dr. Armaghani around May of 2017. He ordered the appropriate scans and shared with me that there was a surgery (Micro Discectomy) that could relieve a great deal of my pain due to a herniated disk at L5 S1. The thought of surgery made me a little nervous and Dr. Armaghani worked out a plan with me to try some less invasive options first. About 3 months later I found myself again needing to see Dr. Armaghani for another flare up. Dr. Armaghani continued to respect my concerns about surgery and we began a plan to try some other on surgical strategies. I experienced a change in condition unexpectedly resulting in completely debilitating pain and some other emergent symptoms. Dr. Armaghani, his PA & ARNP collaborated and responded rapidly to get me in a facility, assessed and into surgery quickly. As soon as I came out of surgery, I had an immediate return of function. I also realized the pain was completely resolved. Today, I have minimal remaining pain and cannot thank Dr. Armaghani & his staff for doing all they could to give me back my life and helping me to avoid permanent damage. Through this experience, I found Dr. Armaghani to be extremely knowledgeable & competent as well as noting he has exceptional bedside manner. I was extremely grateful for his empathy. When things became more urgent and other facilities had treated me like a chronic condition he listened and recognized what was occurring. He explained what was occurring to my husband and I and he then stayed late at the hospital to make sure I received the care I needed. My family and I will forever be grateful to him and his team. For anyone in a similar condition who is told they are a candidate for this surgery, I would say to them you don’t have to live in pain. You don’t have to push on through just because you can. The relief is pretty much immediate. Don’t wait until you risk permanent damage. Lastly, I would highly recommend Dr. Armaghani and his staff! I have been to several orthopaedic doctors over the years but Dr. Armaghani has gone above and beyond of what a doctor would do. I’ve had low back pain with sciatica going down the legs and it got to a point where I wanted to give up. Thanks to him I am now pain free! My experience with him and his office is a 5 star in my book. I would recommend him to anyone who is in need of help. I know a lot of people don’t take the time to write a great review but I think it’s important to let people know there are wonderful doctors out there like Dr. Armaghani. Thanks for making my life pain free! If you have to go to a spine specialist I definitely recommend Dr. Armaghani. He is thorough, friendly and answers any questions you may have. He is an excellent doctor and his staff is friendly and welcoming. I have been to several orthopedic doctors over the years, Dr. Armaghani has gone above and beyond what a doctor would do. I have had lower back pain with sciatica going down my legs and it got to the point where I wanted to give up. Thanks to Dr. Armaghani, I am now pain free!!! My experience with him and his office is five stars in my book. I would recommend him to anyone who is in need of help. I know a lot of people may not take the time to write a great review, but I think it is important to let people know there are wonderful doctors out there like Dr. Armaghani. Thank you for making my life pain free!!! After finding no relief for my husband’s spinal stenosis in Pinellas County, we searched for a doctor at a facility in Hillsborough County. Thankfully, a friend recommended we see Dr. Armaghani. What a breath of fresh air to go to Florida Orthopaedic Institute and work with Dr. Armaghani! He and his staff were efficient and appointments were met in a timely manner. He explained everything to us precisely including the surgery procedure, recovery time, and expected results. The surgery went extremely well and my husband can now walk without pain in his legs. The staff at Florida Orthopaedic Institute were helpful and courteous. We cannot say enough good things about FOI especially, in regards to Dr. Armaghani. We would recommend him highly to anyone with spinal stenosis. Do not let his apparent youth fool you, Dr. Armaghani is awesome! At age sixty-seven, I was having trouble standing up straight and bending over without pain down my legs. I had a previous fusion of L2-4 from a burst fracture nineteen years ago. He showed us how he could add two cages in my lower lumbar area to pull me back up. I also had bone spurs impinging my spinal cord. So, after two surgeries, two days apart, I am standing up straight, my leg pain is gone and I am so grateful God led me to his office. Dr. Armaghani is extremely compassionate, gives you all the time you need and is surrounded by an excellent staff and facility. Vanessa was just awesome, handling all the appointments for testing, hospital, etc. I cannot thank them enough for giving me my life back. Thank you! I was diagnosed with a pinched nerve causing sciatica pain down my left leg. This caused me to have difficulty walking and pretty much doing anything. I saw Dr. Armaghani, who showed me my X-ray of the compression of the nerve. I opted for surgery in August and within four weeks all of the leg pain was gone and I could do anything without pain. I wish to thank Dr. Armaghani, his staff and all the caregivers at the hospital. Everyone was awesome and it has been a life changing experience. Dr. Armaghani first made an examination through x-ray and an MRI scan. Then, he made his diagnosis and suggested I take the time to check the procedure online, ask questions, and do whatever I needed to feel comfortable with this procedure. My procedure went very well, even better than expected. Dr. Armaghani did exactly as he had stated, and I never experienced the pain that I was told would happen. My leg does not throb or go numb and my back pain is reduced as well. Great outcome from the best spine specialist in the Tampa area. Thank you again! Dr. Armaghani is an amazing surgeon with the best communication skills I’ve ever seen as well as his surgical techniques and bedside manner. I had to have an extremely risky surgery on March 14, 2017 after a failed fusion. I’ve never felt so comfortable with my physician and upcoming surgery before. He was very helpful and offered a great deal of support for post-operative pain management and ongoing care. He’s a lifesaver! “This guy can’t me old enough to know what he is doing”, I said to myself when he walked in. Boy did he prove me wrong. He correctly diagnosed a cyst on my spine that other doctors had missed. He did the surgery he confidently told me would relieve the chronic, debilitating pain I had been experiencing for over a year. Six weeks after the surgery and I’m playing some of the best golf of my life! The scariest thing about the whole procedure was that Dr. A was a “Florida Gator”. I didn’t tell him I was a LSU Tiger Graduate until after the surgery. Now he and Tim Tebow are tied for all time greatest Gators!